Where will Pennsylvania’s Austin DeSanto land? 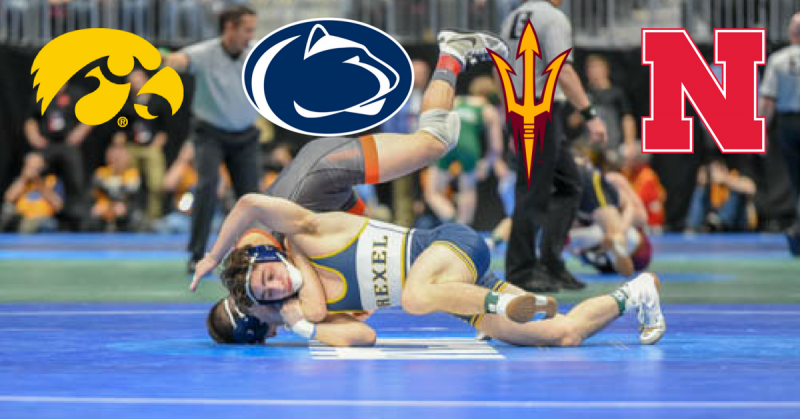 Home/PA College Wrestling News/Where will Pennsylvania’s Austin DeSanto land? Now, after weeks of speculation, it has been confirmed by multiple sources, and first reported by Flowrestling, that Drexel true freshman Austin DeSanto has been granted a release. It has been a wild ride for DeSanto over the last year – doing the unthinkable and defeating Spencer Lee in the Pennsylvania State Finals, dominating at the Pittsburgh Wrestling Classic, and starting straight away for Drexel at 133 pounds. The Exeter Township product had an up and down rookie season – but certainly didn’t finish the way fans were hoping for when he went (2-2) and missed the podium in Cleveland. It was DeSanto’s behavior during his two defeats that had people scratching their heads. Without getting into situational factors for why a release from Drexel was requested, and accepted, let’s take a took at some places where DeSanto could land. Despite his NCAA Tournament performance and antics, he is a high value recruit who will add a major boost to any Division I prgoram for three seasons. Our sources point to a variety of schools where Austin could end up next year. Rumors are swirling that Nittany Lion mastermind Cael Sanderson has already made contact with Austin. There is a compelling reason why. Penn State has some serious question marks in the lightweights. Redshirt senior Corey Keener (Blue Mountain) vacates the 133 pound weight class, which as of now, is wide open for 2018-19. The only 133 pound wrestlers returning next season for Coach Cael Sanderson are George Carpenter, Austin Clabaugh, Dom Giannangeli, Pat Higgins, Mason Lindenmuth, and Scotty Stossel. Blue chip recruit Roman Bravo-Young could end up being the starter as a true freshman – but he hasn’t stepped foot on campus yet. 4-time Pennsylvania State Champion Gavin Teasdale will also be in the mix but he may need to man the post down at 125 pounds where there is another hole. It is safe to say Cael and Co. would greatly benefit from having Austin DeSanto available for three years of eligibility in Happy Valley. Pros: Close to home, it’s Penn State and Cael Sanderson. Cons: Pressure to do well both academically and athletically is high at Penn State. You’re kidding right? It would be like Larry Owings transferring to Iowa and being partners with Dan Gable. Well not really, but close. Can you imagine Spencer Lee having the only wrestler to give him a high school defeat as a training partner? It is not that far fetched as Iowa is in need of a 133 pounder. They lose Phil Laux and return Paul Glynn and Justin Stickley next season. There are no notable recruits who will be in the mix at 133 pounds next season so DeSanto would greatly benefit head coach Tom Brands and Co. Spencer would be a key reason for Austin to make the move – the two have a ton of respect for each other – and they are both high intensity competitors. Pros: Working out with Spencer Lee everyday. Cons: Far away from home. With the departure of senior Ali Naser at 133 pounds head coach Zeke Jones has a void to fill unless junior Ryan Millhof or freshman Brandon Courtney make a move up from 125 pounds. The Sun Devils have verbal commitments from two high end juniors, Nick Ramio (New Jersey) and Julian Chlebove, but they won’t be made available until 2019. Zeke Jones is no stranger to Pennsylvania and currently has two Keystone State studs on his roster. It would be a hike to Tempe, but hey, the weather isn’t so bad, right? Pros: Zeke Jones and warm weather. Cons: Long way from home. Pros: Bryan Snyder and Mark Manning. Cons: Far from home and no guaranteed starting spot.